San Carlos Estates of Bonita Springs, Florida is not the same place as San Carlos Park of South Fort Myers, Florida. San Carlos Estates is a neighborhood in Bonita Springs, just south of The Brooks. What makes the real estate in San Carlos Estates different from most of the other neighborhoods in the Bonita Springs and Estero areas is the lot size. 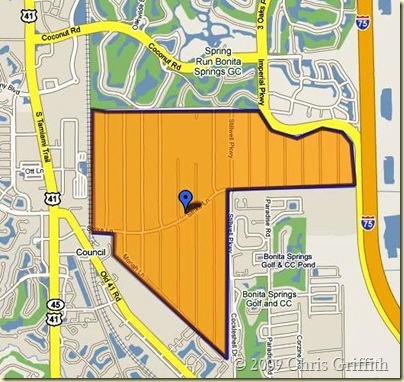 Lots are oversized in San Carlos Estates; most are 1.25 acres in size. There are both single family homes and buildable, vacant lots available in various locations of San Carlos Estates. Vacant lots purchased for the purpose of building a custom home should undergo and environmental audit to make sure the lot is buildable and to verify the type of the trees and wildlife that are on site. Some trees and wildlife is protected and may inhibit building new construction. Cypress trees, gopher tortoise, scrub jay and indigo lizard are protected and complicate development of real estate if they’re located on site. San Carlos Estates is located minutes to Bonita Beach and within bike riding distance to Coconut Point Mall. Florida Gulf Coast University is about 20 minutes drive to the north. There are ample sidewalks along US 41 – Tamiami Trail that will provide residents of San Carlos Estates access to the entire area by non-motorized travel. The community streets of San Carlos Estates were paved in the early 2000’s and city utilities are now available. Properties may or may not be sold with sewer or water assessments due to this new upgrade to city utilities. Access to San Carlos Estates is via Strike Lane off of Old US 41 Road and Stillwell Parkway near Bonita Springs Golf and Country Club at Cockleshell Drive. The community of San Carlos Estates has no common amenities and is not fenced and completely gated. There is one gate at Stillwell Parkway to inhibit travel through by non-residents so that the private streets receive less wear and tear. If you would like a current list of acreage homes or home sites in San Carlos Estates call or text Chris at 239-273-7430.